It is required that “High quality vacuum” for vacuum systems such as semiconductors, organic EL and LCD manufacturing devices and experiment systems which need ultra/extreme high vacuum (UHV/XHV) environment. “High quality vacuum” means that there are no pollution sources, particles and outgassing from vacuum products. To achieve “High quality vacuum”, it is necessary that the appropriate surface cleaning/treatments for parts of vacuum equipments. 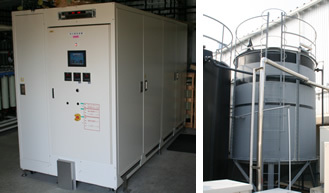 SAN-AI PLANT chooses the cleaning process that is most suitable for every materials and achieve the best cleanliness. Furthermore, the surface treatments such as Chemical Polishing (CP) and Electropolishing (EP) are possible to improve the vacuum property. 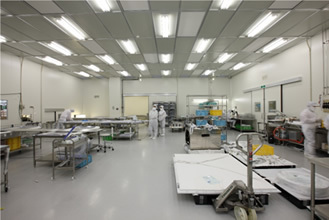 After surface treatments/cleaning, we dry products with nitrogen gas managed by dew point and pack in class 1000 clean room. Therefore we send products for you in the cleanest condition! SAN-Ai PLANT has developed the most suitable solution of Chemical Polishing (CP) and Electropolishing (EP) for various metals. Effects of surface area decreasing and forming oxidized layer by these treatments with Super Micro Cleaning (SMC), our technologies achieve the best vacuum property. Renewal Micro Cleaning (RMC) is the technology to remove attachments form the products and possible to reuse. Furthermore the polluted parts are detoxified to discard by RMC.